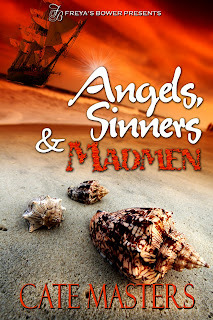 In her review of my historical, Angels, Sinners and Madmen, Lena from Happily Ever After Reviews said, in part: Angels, Sinners and Madmen by Cate Masters is definitely one that will get you intrigued in every chapter. I loved that you have Olivia who is definitely very intellectual and far more mature for her age. People in the 1800’s guard her well telling her what to do never giving her a chance to explore. I loved that Sam is definitely her other half, definitely the apple that tempts her to be free and follow her heart. Cate did a great job creating two people who are lost in the world, finding their way back in a way that will make you jump to see them together. There were some parts that got me so moved and the words Sam speaks to his love is heartbreaking. I loved it and applaud Cate for creating a time in the past that seems so real in this book. It was enchanting! Inside the tall windows of Whelan’s Dry Goods Store hung sail cloth and rope. Anchors and other nautical necessities unfamiliar to Livvie occupied one side of the store. After wandering several aisles, she found the sewing items. One spool of white thread appeared thick enough to sew stitches in horse hide. While she examined it, a movement caught her eye and the back of her neck prickled. She glanced up to see Sam Langhorne stroll in. Walking toward her, his smile widened and his gaze wandered freely across her, sending heated pinpricks across her skin. Her voice failed her. “Pardon?” she whispered. “You aren’t joining Mrs. Crowell’s sewing circle?” He clucked his tongue. “I thought women enjoyed passing the time that way.” His brown eyes sparkled. Stubble shadowed his jaw and chin, framing his mouth. He leaned an elbow on the table and looked up at her. “Ah. Your passels of servants took care of your sewing for you, eh? And here I was hoping you might come lend a hand.” Grinning in a teasing way, he searched her face with intense scrutiny, as if trying to divine the truth. She lifted her chin. “After my mother’s death, my father hired a housekeeper. I’m afraid I wasn’t an ideal charge. I spent more time with Sir Galahad than at home.” Never had she wanted to be one of the primping girls who practiced domestic skills in hopes of enticing a husband, or took more interest in their appearance than anything else. Now she felt deficient in womanly skills. Sam Langhorne made her feel moreso. Since their last encounter, she’d dreamed of practicing womanly skills on him. So he knew of King Arthur. How, she wondered? “My horse, Mr. Langhorne.” Something tightened in her chest while he held her gaze, so she scanned the mending tapes and selected one, hoping he wouldn’t correct her. “I’m sure there is. Nothing comes to mind.” His low voice rumbled like an approaching storm, one of searing lightning and drenching rains. Livvie had always been fascinated by such storms, and the thought of Sam tearing at her clothes like a gale made her shiver. “You’re from Philadelphia?” She’d imagined him a farm boy, perhaps, from some obscure place providing no outlet for his energy. What else would propel a man to travel far from home and become a wrecker? His tone fell flat. “Born and raised there.” He inserted the newspaper in its resting place beneath his arm. “What made you come here?” Surely Philadelphia had entertainments similar to those in New York. Perhaps his occupation–maybe a blacksmith–didn’t allow time for social events. Judging by the abundant muscles on his lean frame, he’d worked hard all his life. He leaned in dangerously close. “Why don’t you let me walk you home, and we’ll continue our conversation?” His lips parted invitingly. No ready excuse came to mind to refuse him. Nor did she want to. The ruckus ceased. She waited for him to walk in again and aim his warm smile at her, but waited in vain. Feeling conspicuous, she pretended to examine other goods and moved toward the window. A few passersby walked the streets. Sam was not among them. Frustration coiled within her. Men were so easily led astray. Sam Langhorne appeared no exception. Perhaps she’d best not spend any more time with him. Seeing him only inspired more thoughts of him. Such unbidden thoughts confused her. He would only bring trouble, of that she felt certain. At the counter, she asked for stamps and paper. The man tallied the items and waited. After a moment, she realized she’d forgotten to inform him of the charge to the Crowell account and produced the signed list. He wrote in a ledger book and gave a curt nod. After noting the amount, she thanked him, put the items into her basket and moved to an empty space at the counter to affix the stamp to her letter. A hot breeze wafted through the open door. Reluctantly, she walked toward it. Another boring day at the Crowell home lay ahead. She stepped outside to take in the breeze. Sam leaned against the wall, his brow knit in reading. He glanced up, and the lines of care on his face erased. The glint of the sun gave his dark hair a sheen. At his feet, Barnaby lifted his head and wagged his tail, his open-mouthed pant a canine smile. “I thought you’d left.” Something effervesced deep inside her and bubbled up to entwine in her breath. Barnaby jumped to his feet and nuzzled against her. She crouched to scratch his face. “I said I’d walk you home. Did you forget so soon?” The breeze ruffled his white shirt and pressed it against his well-defined chest. “No, I….” Words escaped her, though his warm smile indicated they were unnecessary. She rose. “Yes.” Uttering the sole word opened up a wild array of possibilities. She would have to use it more carefully in the future. He held her gaze in such a way, not looking away could imply yes without speaking the word. Yet she did not wish to look away. More congrats to you, Cate! Fabulous review! Thanks so much Debra! It made my week!